I have found in my widow journey and even before as I was going through death’s dark valley with my husband, the Holy Spirit would bring specific scriptures to my mind just as I needed them. God and His Word the Bible was my one constant then and now. It’s only because of His grace that I have come this far. Genesis – He is the Ram at Abraham’s Altar. Exodus – He is the Passover Lamb. Leviticus – He is our High Priest. Numbers – He is our Cloud by Day and Pillar of Fire by Night. Deuteronomy – He is the City of our Refuge. Joshua – He is the Scarlet Thread of our Rahab’s Window. Judges – He is our Judge. Ruth – He is our Kinsman Redeemer. I & II Samuel – He is Our Trusted Prophet. I & II Kings; I & II Chronicles – He is Our Reigning King. Ezra – He is Our Faithful Scribe. Nehemiah – He is the Rebuilder of Everything That is Broken. Esther – He is the Mordecai sitting faithfully at the Gate. Job – He is our Redeemer Who Ever Liveth. Psalms – He is my Shepherd. I shall not want. Proverbs & Ecclesiastes – He is our Wisdom. Song of Solomon – He is the Beautiful Bridegroom. Isaiah – He is the Suffering Servant. Jeremiah & Lamentations – He is the Weeping Prophet. Ezekiel – He is the Wonderful 4-Faced Man. Daniel – He is the 4th Man in the Midst of the Fiery Furnace. Hosea – He is my Love that is Forever Faithful. Joel – He baptizes us with the Holy Spirit. Amos – He is our Burden Bearer. Obadiah – He is our Saviour. Jonah – He is the Great Foreign Missionary that takes the Word of God into all the World. Micah – He is the Messenger with Beautiful Feet. Nahum – He is the Avenger. Habakkuk – He is the Watchman ever praying for revival. Zephaniah – He is the Lord Mighty to Save. Haggai – He is the Restorer of our Lost Heritage. Zechariah – He is our Fountain. Malachi – He is the Son of Righteousness with Healing in His Wings. Matthew – He is the Christ – The Son of the Living God. Mark – He is the Miracle Worker. Luke – He is the Son of Man. John – He is the Door by which everyone of us must enter. Acts – He is the Shining Light that appears to Saul on the road to Damascus. Romans – He is our Justifier. I Corinthians – He is our Resurrection. II Corinthians – He is our Sin Bearer. Galatians – He Redeems us from the Law. Ephesians – He is our Unsearchable Riches. Philippians – He supplies Our Every Need. Colossians – He is the Fullness of the Godhead Bodily. I & II Thessalonians – He is our Soon Coming King. I & II Timothy – He is the Mediator between God and Man. Titus – He is our Blessed Hope. Philemon – He is a Friend that sticks closer than a brother. Hebrews – He is the Blood of the Everlasting Covenant. James – He is the Lord that Heals the sick. I & II Peter – He is the Chief Shepherd. I, II, & III John – He is Jesus Who has the Tenderest of Love. Jude – He is the Lord coming with 10,000 saints. Revelation – He is the KING OF KINGS and LORD OF LORDS! A few weeks ago the pastor of Mansfield Bible Church, Greg Buckles, who happens to be my cousin’s husband and a man who truly has a real Shepherd’s heart, gave a message on how to comfort someone in their loss. His research for this message included talking to several people who have lost a loved one including his sister who was widowed just a year ago. It is the only message like it that I have ever heard and one that is so needed because most of us as Christians do not really know how to give comfort to others. I encourage you to take the time to listen to his message on this link. Scroll the cursor over to 24:24 as Greg gets begins speaking on “Beyond Our Normal Strength”. WHAT CAN I SAY TO A GRIEVING WIDOW? Today I remember my favorite Sunday School teacher Spencer Ingram who went to be with the Lord suddenly yesterday. As I grieve with his wife Betty, I think about all the different things that people will be saying to comfort her and wanted to share this post to help those who might not know what to say. It was written by Fern Ingalls. 1. Don’t Try to Lessen the Loss with Easy Answers. There are many ways in which families, friends and professionals in the field of bereavement can be supportive of those who are grieving. Several suggestions are listed below. Some I have learned through personal and professional experience; many have been gathered from the hundreds of experiences of those who have told me of the support they wish they’d had during the painful process of grief. They also expressed heartfelt gratitude toward those who could see what needed to be done and did it. In assessing the needs of a grieving person, it helps to understand the circumstances. There are enormous differences in the grief process that depend upon the age of the person who died, how he or she died (for example, was it a sudden death, or did it follow a long illness?) and the gender of the survivor (in our society, it is usually more difficult for men than women to express their grief openly). Please consider the following guidelines as suggestions only. Most importantly, trust your heart and your instincts. “He/She isn’t hurting anymore,” “It must have been his time,” and “Things always work out for the best,” are remarks that are seldom helpful. It’s more important for the bereaved to feel your presence than to hear anything you might say. Remember, there are no ready phrases which will take away the pain of the loss. I call these phrases “door-openers.” They invite the bereaved to talk, sharing their pain and memories with the listener. Your greatest gift is your invitation to talk, while you listen-offering no advice or judgments, please. Your presence is enough. Especially with fresh grief, your embrace, your touch and your sincere sorrow are all the mourner may need. Be sure to call or visit the survivor, no matter how much time has passed since the death. The griever still appreciates knowing you care. “May I go grocery shopping with you the first time out?” Each thoughtful gesture gives something of yourself and keeps the survivor from having to continually reach out for assistance. It also lets the survivor know you think he or she is important. Our self-esteem is often low during the early months of grief, and knowing someone cares enough to help does wonders for our morale. You might run errands, answer the phone, prepare meals or do the laundry. These seemingly minor tasks loom large to the survivor, for grief drastically depletes physical energy. An offer to spend an evening just watching television together can be very comforting, especially to someone now living alone. A bereaved person desperately needs a listener who is accepting and supportive and willing to listen patiently to often repetitive stories. The need to “tell the story” decreases as healing progresses. And each time the story is told, the finality of the death sinks in a little more. When feelings of anger, frustration, disappointment, fear and sadness are expressed, accept those feelings. If the survivor keeps them bottled inside, they will slow the healing process. Sharing thoughts and feelings lessens the stress. The increased stress experienced during early grief can lead to health problems for some people. Help your friend stay healthy by listening. Allow the Expression of Feelings. Allow the Survivor to Grief in Her Own Way. Don’t push the mourner to “get over” the loss. If he needs to rake leaves or chop wood to release energy and tension, let him. If he wants to pore over old pictures or read every book on grief he can find, let him. We all grieve in our own way; avoid being judgmental. Expect good days and bad days for some time. The highs and lows are part of the process. These feelings have been described as waves that sweep in uncontrollably. Gradually the good days become more frequent, but bad ones will occur even a year or more after the death of a loved one. Remember Special Days and Times. Double your efforts to be sensitive to the mourner’s needs during difficult times of the day or on days with special meaning, like holidays, the loved one’s birthday or wedding anniversary, or the anniversary of the death. Mark your calendar so you’ll remember to reach out to the person on or before those special days. Don’t Protect the Mourner from the Pain of Grief. The survivor must adjust to the fact that the loved one is gone. If you attempt to protect her from her grief, you will get in the way. 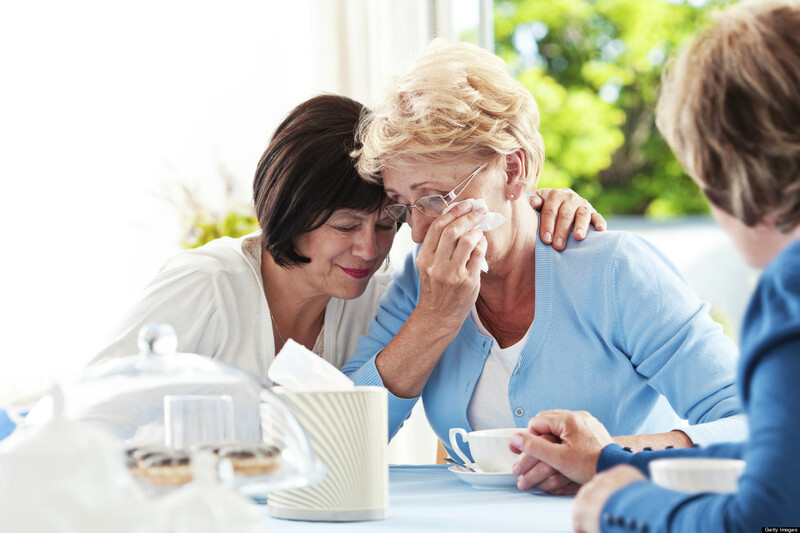 Grief is hard work and others cannot do it for us, though they can help with their support and encouragement. But there is no easy way out. She must walk through the pain to come out on the other side, healthy and stronger. Assist in Finding Self-help Groups. The tears in the eyes that understand when I speak of my pain and loneliness… These help to give me faith that life is still worthwhile. Knowing I am not alone lets me face my sorrow. Only then can I get on with living. Know that Recovery Takes Time. Don’t expect the grieving person to be “over it” within a few weeks. Great waves of emotion may sweep in for many months and then, slowly, gradually, the intensity subsides. It doesn’t happen a day after the funeral or even two months after it, as many people believe. Sometimes the real grieving is just beginning by then. It may be more than a year before you see the results of your caring and support-but when your friend smiles again and feels less pain, the reward is there. During the first few months after a death, there’s a tendency to focus on the survivors, while the survivors are focusing on the one who died. By relating your memories of the deceased, you are offering a precious memento to the grieving person. Your love and concern are shown not only in what you share, but in the fact that you took the time to do so. Keep in mind that a grieving person is under extreme stress; don’t press him to participate in outside activities until he’s ready. Trust him to know what is best. Know that Your Friend Will Always Remember. For the rest of her life, a tear may be shed when a special memory is recalled. 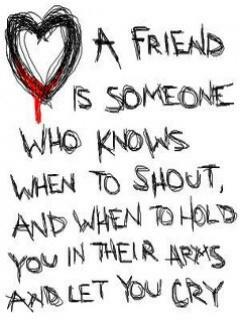 Your friend is who she is today because of having loved that person. Denying the deceased’s past existence denies a part of your friend. Love her past as well as her present, and you and your friend will be richer for it.